Sunvibes consistently strives to go above and beyond your expectations. SUNvibes Tanning Studio’s growth and success can be attributed to our strong belief in and constant dedication to superior customer service, cleanliness and well maintained, top of the line equipment. In addition, each member of the staff is highly trained and Smart Tan certified to help every customer tan responsibly and achieve a personal and optimal tanning experience. SUNvibes Tanning Studio is proud to be Vaughan’s favourite tanning salon, where you can always expect a friendly welcome, a customized experience and of course achieve the most beautiful tan ever! 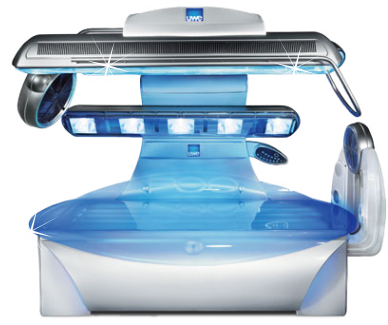 The P90 is Sunvibes Tanning Studio’s strongest combo bed featuring high pressure bulbs on top and low pressure bulbs on the bottom. This 12 minute bed provides the best of both tanning technologies, offering a long lasting bronze tan. The Affinity 800 is one of the most powerful tanning beds on the market! You can achieve a beautiful tan in 12 minutes or less! This magnificent bed is fully air conditioned (works so good you won’t feel hot at all), has cooling water misters, aroma therapy and high-pressure facials. 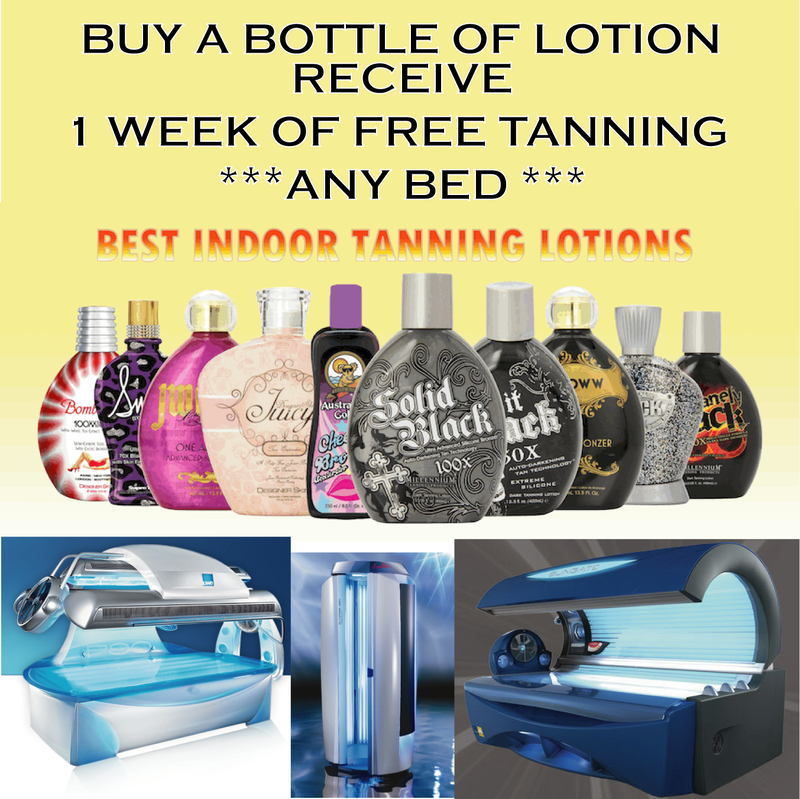 For our busy customers who prefer a stand-up tanning unit. The Sunrise 480 delivers a beautifully even, full-body tan in a 9 minute exposure schedule for tanners who are on the go. There’s No Power Like a StarPower bed. 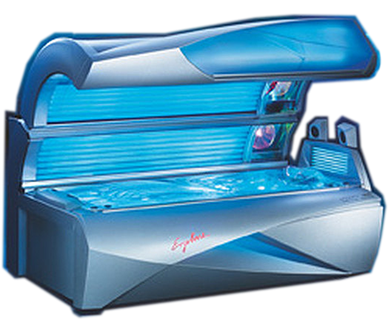 The StarPower is a 12-minute mega bed that features high-pressure facials, bronzing bulbs, neck & shoulder bulbs. This wrap around bed’s power is second to none. 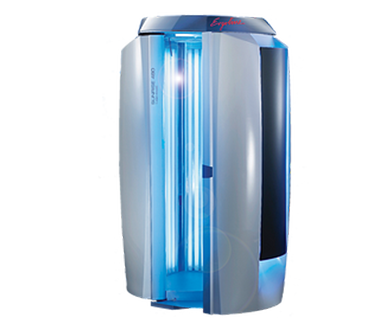 The Solaris 442 tanning bed is a 42 lamp, 15 minute tanning bed that offers intense tanning power. For the tanner who demands the most from each tanning experience, the Solaris 442 does it, definitely a salon favourite! This super bed provides dark color fast! Perfect for those, who don’t tan easily. Bronze, hydrate, and smooth your skin in just 60 seconds. 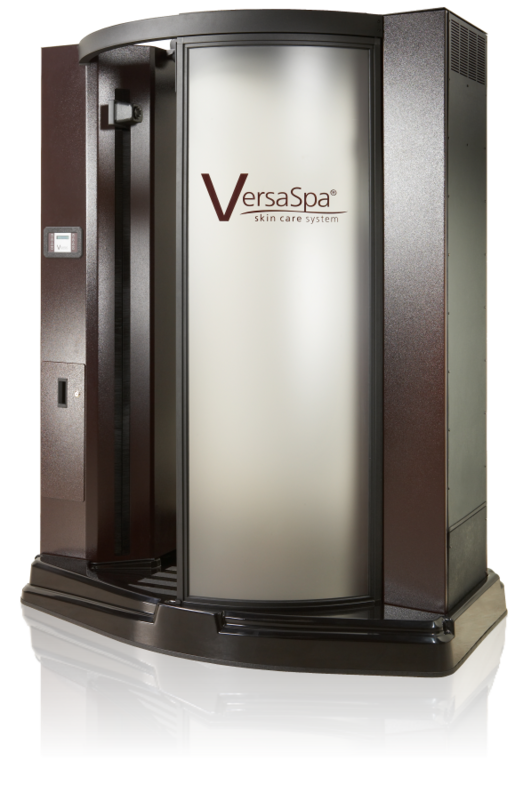 The VersaSpa by Magic tan is the latest in UV free spray tanning. Just one session will give you a beautiful glow without that orange look. Achieve your darkest, quickest tan by doing our Double Dip, which is tanning in any bed and then getting a Spray Tan. We will give you a complimentary robe to wear from your tanning bed to the VersaSpa. If you want great results fast, a Double Dip is your deluxe way to get there! The process of tanning in a tanning bed and outdoors under the real sun is basically the same. However, the main benefits of indoor tanning is speed and exposure control. It does not take all day to get a tan indoors. Depending on your skin type, it may be just a few minutes. Maintaining your tan indoors can take as little as 60 minutes a month. Also, you can control how much sun you are getting when in a tanning booth whereas the strength and amount of ultraviolet rays emitted by the sun varies from day to day. At SUNvibes we regulate how much time you are allowed to spend in the booth. Our state-of-the-art equipment allows us to monitor and scientifically control your ultraviolet UV-A and UV-B exposure. We make sure you tan and not burn. Also, don’t forget that you will never have to worry about the weather! At SUNvibes your tanning experience will always be in a pleasant, climate-controlled environment. If you are unsure as to which lotion is right for your skin type, visit our SUNvibes location. One of our Tanning Professionals will be able to help you to select the right lotion that will protect your skin and give you the best color possible. After tanning for a while, some tanners will reach a point where their skin seems not to be getting any darker. As your tan progresses, your skin becomes thicker which makes it difficult for UV light to penetrate the upper layers of skin. This is commonly referred to as a tanning “Plateau.” Using a tan accelerator and extender are extremely important when you hit this Plateau. Your skin cells are standing up as much as 45°and are actually reflecting the UV rays. Using a lotion accelerator while tanning will help these cells lay down and become more translucent; therefore, more receptive to UV rays. The Tanning Plateau can be overcome not only by using a tan accelerator but by using a range of tanning equipment with varying UVB/UVA ratios to stimulate different levels within the skin. For some tanners this may mean stepping down a level for a few tans to see results. Please consult a SUNvibes Tanning Professional for help in maximizing your tan. The most beneficial way to care for your skin is to take your time. For the best tan possible, build your base tan slowly by increasing your tan time gradually. Tanning for too long can lead to overexposure and reddening, which just slows down the process. Consult with your SUNvibes Tanning Professional for the recommended time each time you visit. All of our employees are Smart Tan certified and are able to gauge your skin type and recommend a length of tanning session that will be the best choice for you. Trust us, when you have achieved that desired bronze glowing tan, you will be thankful you took your time and did it the right way! Another important way to care for your skin is to moisturize. The tanning process can take up to 24 hours, even after only several minutes in our equipment. During this process, color continues to develop and skin may lose its natural moisture and nutrients. Therefore, the best way to care for your skin during tanning is to keep it nourished and moisturized with the proper tan extender. Consider investing in one of our specially formulated tan extending lotions. They are designed to keep skin soft and healthy and keep your tan looking its best. Ask any SUNvibes Tanning Professional to recommend the best tan extender for your skin type to not only extend the life of your tan, but keep it bronze, vibrant and beautiful! It is required that you wear eyewear that protects against 99% of UVA rays and 99.9% of UVB rays. You cannot just close your eyes; your eyelids are too thin to block UV. Eyewear must be certified and approved by the FDA. Our SUNvibes location offers temporary and multi-use goggles that meet Provincial standards. What are the benefits of joining a SUNvibes “Sun Club”? It Saves you MONEY and time – Joining a SUNvibes “Sun Club” will allow you to get the best price per session and the payments are automatic which makes it easier for you! Exclusive discounts – All of our Sun Clubs have exclusive discounts on products and upgrades which you can take advantage of each time you visit! There is no limit! It’s up to you how much you save! Consult with any SUNvibes Tanning Professional for more details about our Sun Clubs. The FDA recommends that you wear eye protection, nose filters, lip balm and protective undergarments during your Sunless session. These are offered at our SUNvibes location. For more information please ask a Sales Associate or visit the FDA website. Absolutely! In fact, we recommend it. Sunless tanning results are phenomenal over a nice base tan. It is the best way to obtain a fast, instant and natural tan. At SUNvibes we refer to this process as a “Double Dip.” Please ask any SUNvibes Tanning Professional for details on our Double Dip process. Our Sunless equipment has three different solutions made specifically to suit a wide range of client skin tones. It is important to pick the formula that is right for you. If it is too dark for your skin tone you are more likely to be unsatisfied with the results. Our solution is also made with natural ingredients to keep your skin nourished and help it absorb the solution for even and natural color. All SUNvibes Tanning Professionals are trained to help you select the right solution to achieve the most natural tan possible. Got a question or feedback? Please fill out the form below and we will get back to you within 2 business days. For faster response, please call us directly at (905) 264-9544. 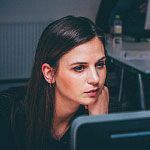 SUNvibes is constantly searching for remarkable people, who are put together differently than most. 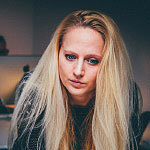 We are growing and we continually seek new talent. We are always looking for Tanning Consultants, Management and just about anyone who can convince us they belong and can make a difference. Please contact us if you are interested in joining our team! © Copyright 2017 SUNvibes. All rights reserved.